I’ve been making pies for a long time. My mom taught me to make a homemade crust when I was young, and I’ve been making them every Thanksgiving, Christmas, Fourth of July and occasional birthday since then. Here’s one I did for Thanksgiving last year (we ate it while watching football :). My mom originally learned to make a crust by using a fork to combine the butter and flour … and that makes my hand hurt just thinking about it. Later, she upgraded to electric beaters after watching Julia Child on TV. Better, but still a hassle because flour flies everywhere. Today, I use a food processor for all of my crusts. Using a food processor makes the mixing so much easier. Just be sure to remember these two rules: (1) Don’t over-mix the dough; and (2) Use cold butter and ice water. Both of these rules are intended to keep the butter in small pieces surrounded by flour (rather than fully combining with the flour). These little pieces of butter, in turn, will keep your crust flakey and light. Not over-mixing the dough ensures that the butter stays in small pieces within the dough. When the pieces of butter later melt in the oven, they release steam. The steam creates little pockets of air, which separate the layers of dough while baking; the separation, then, creates a flakey crust. Using ice water furthers the same purpose: the low temperature keeps the butter cold, which helps the butter stay in small pieces. The small pieces of butter then melt while baking, release steam, create pockets of air and thus, a flakey crust. If the dough sticks to the counter while you’re rolling it out, just ball it up and start over. Sprinkle a bit more flour on the counter this time and turn the dough as you roll to be sure it isn’t stuck again. If your dough is too dry and cracks when you roll it, flick a sprinkle of water on the dough, then ball it up and try again. The water will moisten the dough, and your hands (98.6 degrees F) will warm/soften the butter, which will also moisten the dough and make it easier to roll out. If your dough breaks when you try to move it to the pie plate, just patch it together with some spare dough (you won’t see the patch after baking anyway!). And if you can’t patch it then ball it up and try again. Most important, don’t expect perfection! No two pie crusts are ever alike, and just when you think your crust is the ultimate failure, it may turn out to be your best one yet. 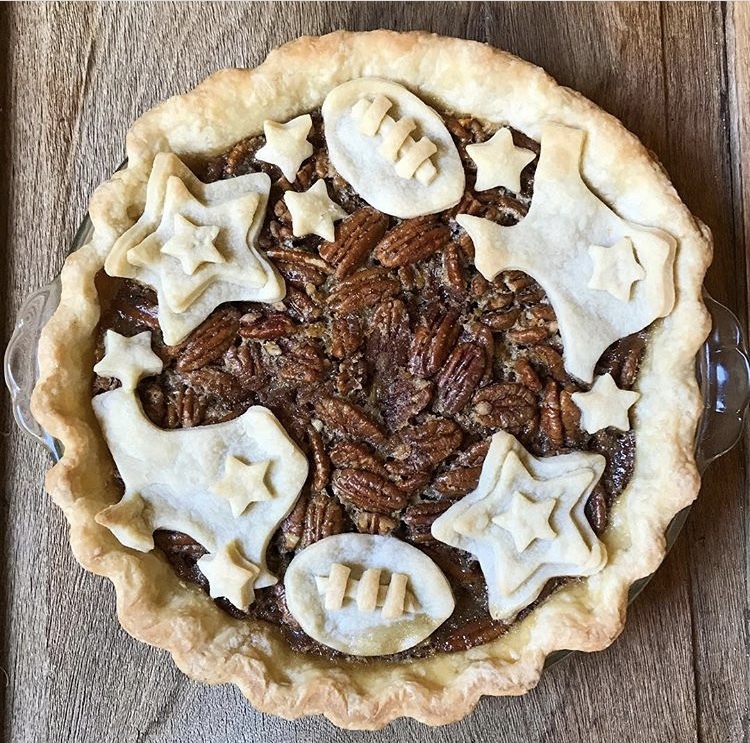 Once you get confident with your crust-making skills, you can have a little fun with the decorations! To decorate the apple pie pictured below, I used crust cutters for the leaf shapes, and then painted the leaves with food coloring + water, like watercolors. For the next crust, I used lattice technique for the basket, and cookie cutters for the cutouts. Then I painted the cutouts with food coloring + water, and nestled them into the basket. If you have time, read through the recipe one time so you have an understanding of the big picture before you start. After you read through, you might also want to watch this short video showing the first several steps. Want to see it again from a different perspective? Try this one. Add the slices of butter to the dry ingredients in the food processor. Add five tablespoons ice cold water to the butter and flour mixture. Pulse several times until it has the texture of cornmeal: The dough should still feel dry when you run your fingers through it (watch out for the food processor’s blade when you do this! ), but will hold together in a ball when you squeeze it in your hand. If the dough is too dry (does not hold together when you squeeze it), add one more tablespoon of water and pulse again. Important: Do not process until the dough pulls together into a big ball — that’s too much. Also, do not add more than five or six tablespoons of water; too much water makes your dough sticky, which means you will have to add a lot of flour to roll it out, which means the dough will taste bland and may become tough. Spread a large piece of Glad cling wrap on the counter (approx. 1-2 feet long) with the sticky side face up. Gently dump the dough (it will still be a little crumbly) onto the cling wrap. Now you have made your pie crust! Congrats! Way to go! Woohoo! The next step is rolling out the dough. Basic instructions for that are provided below … but this post is already super long, so I’ll provide details and pictures in my next post! 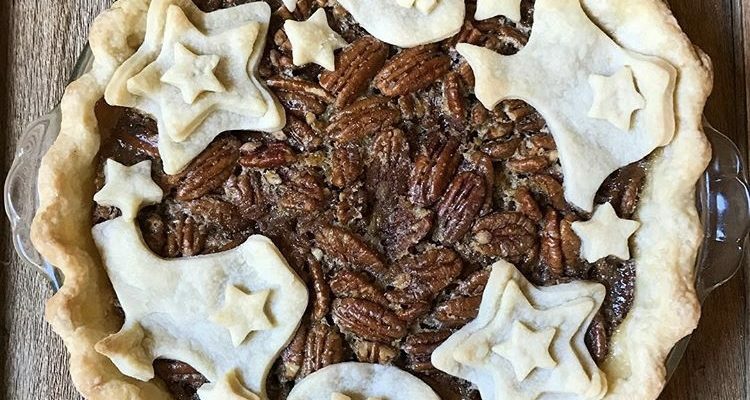 If you are making a filling that needs to be cooked (such as pecan or pumpkin), put the pie crust in the freezer for 20 minutes. (This will help the crust hold its shape when you bake it.) Remove from freezer and pour the filling directly into the unbaked pie crust. If you are making a filling that can go in raw (like apple or berry) with a double crust, put the filling into the bottom unbaked pie crust. Then place the second pie crust over the filling. Seal the edges of both crusts by pressing the crusts together, and then tucking them under to form an even edge. Use your hands to form a decorative scalloped edge if desired. With a sharp paring knife, make four 1-inch to 2-inch slits in the top pastry. The slits should form a cross shape, but without meeting in the center. Put the entire pie into the freezer for 20 minutes while you preheat the oven. In either case, use a pie shield if you have one for the first half of the baking time. This will keep the crust from burning. When the pie is finished baking, remove from oven and let cool. **Alternatives to Homemade Crust: Trader Joe’s Frozen Pie Crust. Here are some tips for working with a TJ crust. If you use a TJ crust: defrost the crust completely and then bring to room temp. Pull the dough off the plastic wrapper and shape it into a ball. Then roll it out yourself. Supposedly you can take the crust out of the box and just slide it into your pie plate, but in my experience the crust always breaks into pieces when you try to unfold it, even at room temp. So skip that hassle and just ball it up and roll it out yourself. Hi! Where can I get the crust cutters? Hi! I have some from Williams Sonoma, Michaels and Amazon. Look for “pie crust cutters” or “cookie cutters plungers” or “fondant cutter plunger stamp.” My favorites are the ones that have a “plunger” that you press down gently to get more detail — like lines in the leaves. Hello! Thank you so much for sharing this straightforward (no shortening) recipe! May I ask, can I freeze this dough? Or will it be ok in the fridge for 24 hours? I’d like to bake an apple pie tomorrow (your grandma’s recipe) but want to get the crust out of the way tonight. For me to double the recipe to make 2 crusts at once? What food processor do you use? I need a good one.